You don't need an excuse. New Year's Resolutions are made to be broken. If you want pie, well, as Marie Antoinette said, "Let you eat pie." But that's doubly true on January 23, National Pie Day. Even if you think pie is the Morty to cake's Rick, turning down a free slice of pie is a punishable offense in some jurisdictions. So, get out there and celebrate pie of one form or another. If you decide to get after a pizza, that can even pass as a celebratory gesture. Pie Day is for everyone. 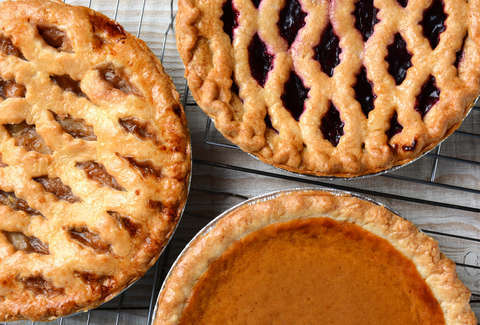 If you need a little help getting your bearings on National Pie Day, here are the places offering free and discounted pie and pizza in honor of this national celebration of flaky crust, fruit filling, and whipped cream topping. The deal: National Pie Day lands on a Wednesday. Fortunately, every Wednesday, Village Inn offers a free slice of pie with any dine-in purchase. The deal: Get a free sweet when you sign up for Corner Bakery's e-club, which is basically just the email newsletter. The deal: Grab a free slice of apple crumb or cherry crumb pie with any purchase in honor of the foodstuff that has been around since the Roman empire. The deal: The restaurant's Whole Pie-To-Go promotion is back. Take your pick of more than 20 kinds of pie that will start at just $7.99 for a whole pie. The deal: Order a pair of entrees and you can get a free slice of Mexican Apple Pie if you show the promo image that will be sent to e-club members and posted to the restaurant's social media pages. The deal: Although it's not explicitly tied to National Pie Day, the bake-it-yourself pizza chain just launched a new promotion dubbed the "100K Pizza Taste Text." The first 100,000 people who join the company's text alert club will receive a code for any free large pizza ordered online. The deal: You might assume National Pie Day is just for apple, pumpkin, key lime, and French silk, but pizza is also on the menu. Get 20% off any one pizza with the code "PieDay19." The deal: The shop is getting its Super Bowl deal running early. Pick up any two large pizzas and fresh QuesoStix with Marinara Dip for $19.39. The deal: Take home a $1 medium one-topping pizza with the purchase of a large one-topping pizza at regular price. Use the code "MEDIUM1" to take advantage. The deal: Take $10 off one or $25 off two Family Feast orders with the promo code "TOUCHDOWN." The deal: To celebrate students returning from winter break, you can grab three free chocolate chunk cookies with any delivery. You'll still have to hit the delivery minimum, though. The deal: Dine-in to get endless soft or crunchy tacos for just $8.99. How endless is endless? There's only one way to find out. The deal: The cocktail of the month is a Captain and Coke, which you can get for just two bucks all month long. The deal: The folks at T Bell will treat you to a free drink -- any drink -- with any purchase. Really, don't pay for you drink next time you grab a Crunchwrap. That'd be silly. The deal: Wendy's is bringing back the Giant Junior Bacon Cheeseburger for the holidays, and you can get it as a combo meal -- with a 4-piece chicken nuggets, small fries, and a drink -- for $5. The deal: Grab a stack of three fluffy pancakes for 89 cents. You can also take advantage of the royal burger chain's popular 10-piece nuggets for $1 offer, among other deals. The deal: Grab a three-piece of chicken tenders or bone-in chicken with a biscuit for just $3.99. The deal: Every Thursday, B-Dubs unleashes deals on boneless chicken wings. The discounts will vary by location, but you can count on getting a deal any time of day on Thursdays. The deal: If you pick up two items off Potbelly's underground menu, you'll get a freebie off that same menu, as long as you're a Perks member. The deal: Grab an ice cream sundae and they’ll throw in another one for free every Wednesday. The deal: Get $10 off any bottle of wine. You can also get any pizza for $9.99. The deal: For a limited time, you can pick up all-you-can-eat pancakes with any breakfast combo. You can also just do the bottomless pancakes for $4.99. The deal is only good on buttermilk pancakes when dining in. The deal: In late December, the Golden Arches brought back its 2 for $5 Mix and Match Deal where you can pick two items off the menu for five bucks. That now includes the Quarter Pounder with Cheese. The deal: Buy a 16-ounce Snapple or 20-ounce Canada Dry and get a free bag of Cumberland Farms Blissful Birthday Blast Cookies. The deal: Conrad's wants you to believe it's "the year of the tater tot." With how 2018 went, why not? It's as likely as anything else. To celebrate the best-ever year for Napoleon Dynamite, they're giving out free Tot Wraps for an entire year to anyone named Conrad, Tate, or Tot. All you have to do is show your ID. Though, the generous offer is only available at the Wicker Park location. The deal: Sign up for the Carl's Jr. promo club, and you're going to get a free small order of fries and a small beverage. The deal: Download the DQ mobile app and have your rewards loaded with a coupon for a free small Blizzard. The deal: Sign up for Arby's email newsletter and start with a coupon for a free roast beef sandwich. The deal: When you download the Baskin-Robbins app for the first time, you get a free regular-sized scoop as an in-app offer. The deal: You get how this goes now. Sign up for their Inner Circle club, and new members get a coupon for a free bagel with cream cheese. The deal: Find a similar deal here. Sign up for the Shmear Society and grab a free bagel. The deal: Join the restaurant's Club Baja membership program, and you'll get an offer for a totally free taco, valid for one chicken, carnitas Baja, or Americano taco. The deal: Sign up for the Toasty Points loyalty app and get rewarded with a free 4-inch sub with any purchase. The deal: Sign up for Del Taco's Raving Fan eClub and get two free grilled chicken tacos or Del Tacos for signing up. If you download the Del App, you can also land another pair of free Del Tacos. The deal: Get a free order of fries when you sign up for "The Club." The deal: Sign up for the E-Club, and you'll get a coupon for a half-gallon of Legendary Iced Tea with any purchase. You'll also get a coupon for a free Bo-Berry Biscuit with any purchase on your birthday. The deal: A free order of personal fries are headed your way if you sign up for MOOYAH Rewards. The deal: If you're new to My Cold Stone Club Rewards you'll get a buy-one-get-one-free coupon on Creations. The deal: If you sign up for Loco Rewards you'll bag a free pollo bowl. The deal: Download the Wetzel's Pretzels app, and you'll be gifted a free pretzel item from the pretzel shop. You'll also get a freebie on your birthday. Happy early bithday! The deal: Sign up for the e-club, and you get a free two-pack of croissants or muffins. The deal: Join the Premier Rewards Plus program, and they'll hook you up with a free Pizookie. (That's a deep-dish-inspired cookie if it wasn't immediately clear from the weird portmanteau.) Bonus: You'll get another free Pizookie on your birthday. The deal: Sign up for the rewards program -- Slab Happy Rewards -- and a free ice cream is headed straight for your mouth. The deal: Sign up for the take-and-bake chain's email offers, and you'll get a code for 25% off your next online order of $20 or more. If you know of any deals we missed, shoot us an email to news@thrillist.com and we'll add 'em here.